-To place the great wide world at your doorstep for you who yearn to travel with all the comforts of home. -To provide a more satisfying, meaningful way of travel that offers complete travel independence, wherever and whenever you choose to go or stay. -To keep alive and make real an enduring promise of high adventure and faraway lands... of rediscovering old places and new interests. -To open a whole world of new experiences... a new dimension in enjoyment where travel adventure and good fellowship are your constant companions. -To encourage clubs and rallies that provide an endless source of friendships, travel fun and personal expressions. -To lead caravans wherever the four winds blow... over twinkling boulevards, across trackless deserts... to the traveled and untraveled corners of the earth. -To play some part in promoting international goodwill and understanding among the peoples of the world through person-to-person contact. -To refine and perfect our product by continuous travel-testing over the highways and byways of the world. -To strive endlessly to stir the venturesome spirit that moves you to follow a rainbow to its end... and thus make your travel dreams come true. Wally Byam was a great inspiration to me. I already had a deep love for travel and a love for the silver trailers. When I began studying the Airstream I discovered Wally Byam and his story. The more I read the more I liked what he was saying. The time was in the early 1990s. Although Wally had passed away in 1962, his words were very much alive to me. He wanted people to take advantage of the freedoms we have as American citizens, to turn off the TV set and get out to see the USA and more. Please let me recommend a DVD for you. Silver Palace: An American Travel Adventure by Miles Fawcett. Miles is an Englishman who had directed another documentary on classic American autos. This 28-minute documentary focuses on the WBCCI international rally and the people, the Airstreamers involved. I bought several copies of this video around 1995 and played it for anyone who would sit still for thirty minutes. But I especially played it for my family, to let them know I was not alone in my desire to travel by trailer. Yesterday, I was actually in the neighborhood on business. 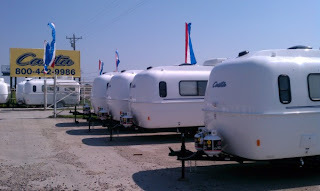 So I took a quick trip over to the Casita plant in the suburbs of beautiful Rice, Texas to check out the Don Pods on the lot and in the showroom. Don Pods In A Cage!! There they were, all in a row, in a cage! I didn't ask what these particular Don Pods did to be locked up in time-out like this. Sometime when teaching 5-year olds, I could have used a cage like this for a couple of them. It would have come in handy after lunch for several of the second-graders! Yes, Don Pods were everywhere. I turned around and there were a bunch of Don Pods all in a row. I guess these Don Pods were ready to go home with their new owner. Each one had a different owner's name on the window sticker. It is true, they all look alike to the naked eye of the unbeliever. It's kinda like church camp...you had to see it to believe it. But when you get one home, you can personalize it and make it your own "pod away from home." 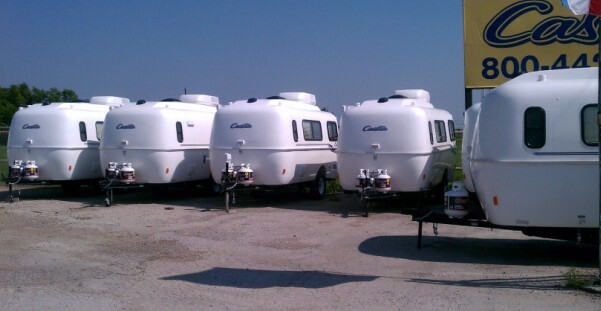 And all these Don Pods are waiting for the owner to come take them to RV freedom, to the lake or to the mountains...or even to sunny Sarasota!! Yes it was worth another short trip to Rice, Texas to examine the Don Pods at their birth place. There is peace in the world again!!! So here are some thoughts about being unique. This elaborates just a bit on post number two. When I want to do something, make a purchase or do something I consider an important life change, I start with plenty of research before taking action. Then when I make my decision, it is almost always the correct choice. This questioning behavior really annoys some people who do not like to be bothered. I know other people who will make a move or purchase with little if any research, then grumble when it is the wrong decision. And we have to listen to their grumbling. All they had to do was ask a few questions before buying the wrong car or buying the wrong house or making the wrong move or getting the wrong satellite dish or whatever. City traffic is stressful. After several years on the ground in Dallas, I realized I missed the road, getting away from city life and seeing the countryside. 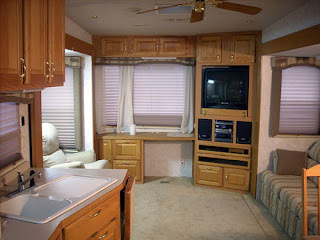 So as usual, I began doing research and discovered three interesting RV clubs. I quickly joined the Good Sam Club and Escapees to read and learn what I could learn. I "researched" for several years before buying my '86 Argosy and I have enjoyed it since 1997. It was the right decision. 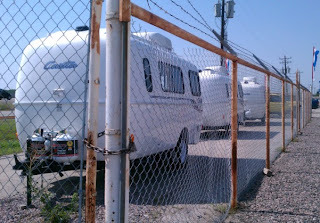 When I bought the Argosy, I also joined the WBCCI, the Airstream club. Since I was not able to travel on any WBCCI caravans at all and because their magazine was little more than a schedule of rallies, I let that membership go after just a few years. Had I kept up my WBCCI membership, it would be approaching fourteen years. Ya see, not everyone is "normal." Not everyone does things the same way. Not everyone lives the "husband, wife, two kids" lifestyle. Not everyone even lives the house-in-the-suburbs lifestyle, although I did own a house in the suburbs at one point. Not everyone is married. Not everyone is even part of a couple. Not everyone has a "regular" nine-to-five job. Not everyone goes to work on Monday, works five days and takes off on weekends for camping trips. Not everyone lives the same normal "lifestyle" that the vast majority of Americans live.Not everyone has a spouse who works. 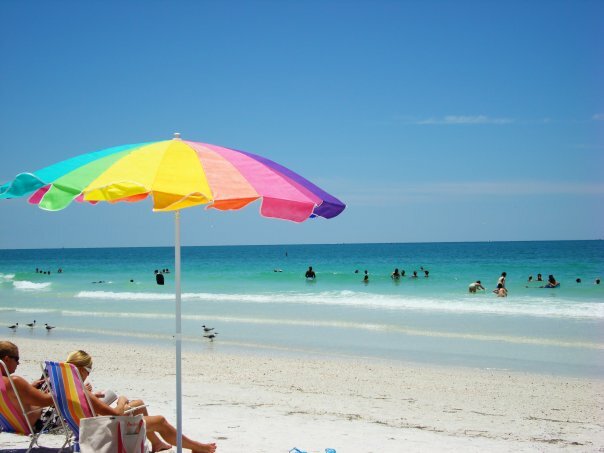 Not everyone works fifty weeks a year, then takes a two week vacation to the mountains or to the beach, then returns home to start the cycle again. You Don't Even Go To Rallies! I haven't even had a chance to go to any RV rallys at all except for a Region Nine WBCCI rally before I bought my Argosy. I don't do weekend trips now because I ALWAYS work weekends, two or three jobs. Monday has been my "day off" for several decades. Friday, Saturday and Sunday are my big workdays every week. I am a musician, an entertainer, a teacher. I didn't choose it, it just happened that way. I have shared the stage with some of the greatest entertainers in America yet my family thinks I am going through a phase. It is difficult when people do not understand that some folks don't "fit" into life the way they do. My sweet Mom and Pop indulged all three of their sons, even when they did not completely understand. But some of my family and friends think this RV lifestyle is a bit strange. Here's a thought for ya: those who march to a different drummer are usually fairly content in their lifestyle, even if they live in an aluminum tube or a fiberglass egg. Now where did I put that road map?? You're Not Gonna Live In A Trailer For The Rest Of Your Life??? "I didn't say that!! I said, I'm gonna be a full-time RVer. The rest of my life isn't here yet." That is how most of my conversations became with relatives and friends who are not RVers. They do not have a clue unless they are RVers. Most people are "normal" complete with all the accoutrements, spouse, kids, house, mortgage, car-payments, etc. I have never been quite normal. A friend said I was a changeling. A changeling is a infant born to the fairies then left under a stump in the forest. Humans find the infant changeling and take it home to raise it as a normal human baby. But the changeling is never really a "normal" human. My parents had a wonderful life of sixty-two years together. 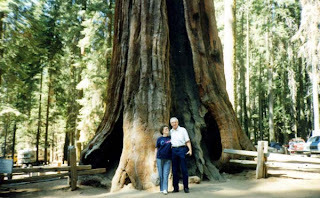 They loved traveling in their Grand Marquis and staying in the local Holiday Inn or La Quinta. But remember, they also raised a changeling son...little ole me! Not everyone lives the traditional life with spouse, kids, etc. Some people march to a different drummer...and enjoy it. Not everyone has a 9-to-5 office job or wants one. Not everyone wants to own a home or do yard work. To some folks, relationships are very important, even more valuable than possessions. Most of all, not everyone wants the same thing every day or every year. Some folks enjoy change and adventure. Some people enjoy the adventure of traveling to new places, seeing new things and meeting new people. I have a brother whom I love. But we are so different. He has a beautiful home and yard. His house looks like a photo-spread from Better Homes And Gardens magazine. He loves his yard work and loves his immaculately decorated home. And he doesn't like traveling. On the other hand, I could be very happy traveling all across the USA, living in a different town each month! Indeed, that sounds like a great way to enjoy life, especially when traveling in an RV. Around fifteen years ago in preparation for my new lifestyle, I had become a member of ESCAPEES and THE GOOD SAM CLUB, both RV clubs for serious RVers. Escapees has a wonderful magazine with most articles written by Escapees members. I photo-copied articles from the Escapees magazine about baby-boomers who are full-timing. Thinking I could share my desires for travel, I gave the articles to my family members who usually responded with a puzzled look. I wasn't seeking their approval. I only wanted them to have an idea of why I wanted to do this. I also wanted them to know that other people, plenty of other people felt the same way. No, they don't quite get what the changeling was trying to tell them. So I did it anyway. I am happy and they still think I am a little nuts. Listen to me. If you are considering living an alternate lifestyle, the RV lifestyle, do not expect anyone in your family or broader circle of friends to "get it." For the most part they will not understand what you are doing. They will not get excited when you describe the procedure for dumping your tanks. They are not thrilled by your 3-way refrigerator. Nor are they as concerned about your anti-sway device as you seem to be. Don't expect them to understand, because they never will. But I say to you...go ahead with your ideas. Do your research, set your time goals and work your plan. Don't be discouraged when they look like you have lost your mind. You will find like minded people who have been there and done that. They are the ones who will encourage you along the way. From their experience, they can help you to avoid the pitfalls and have a better time. So I say, do it now. Don't wait. Adventure lies ahead and you don't want to miss it! You are not getting any younger. You can't take it with you. 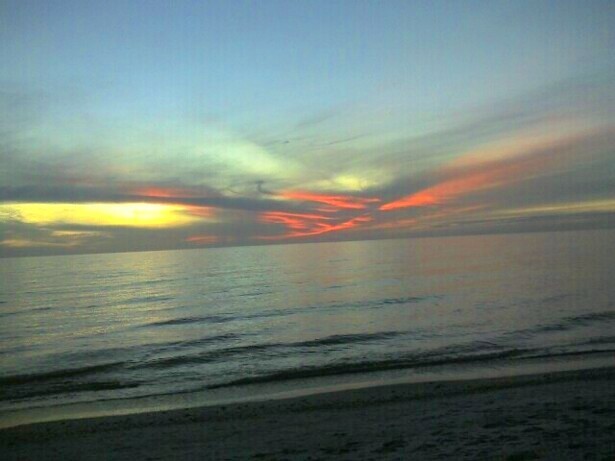 Enjoy it while you can. Take plenty of photos and keep a journal, even a blog to keep the memories fresh. Do it now! Don't wait!! In the beginning was an interest in traveling. Back in the olden days when I was just a kid, our family took vacations together. Our vacations were usually less than 200 miles from home. We sometimes drove to Sardis Lake in Mississippi. We also had family gatherings at Chickasaw State Park in southwest Tennessee. 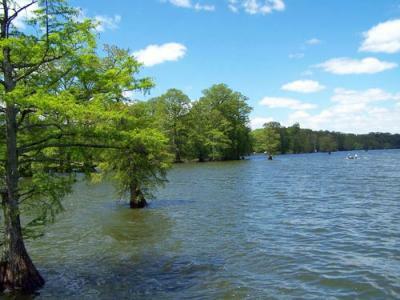 But I think my favorite place was beautiful Reelfoot Lake, a natural lake formed by a series of earthquakes during the winter of 1811 and 1812. 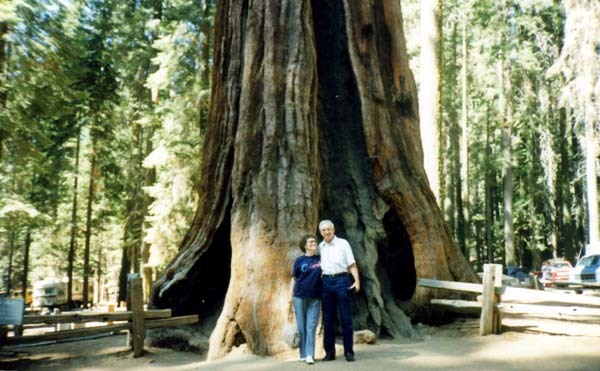 Mom and Pop also took my little brother Steve and me to the Great Smoky Mountains National Park when I was around 12. In those days our mode of travel was a car and our evenings were spent in the local motel. As a performer I was offered many chances to travel, first regionally then across most southern states. 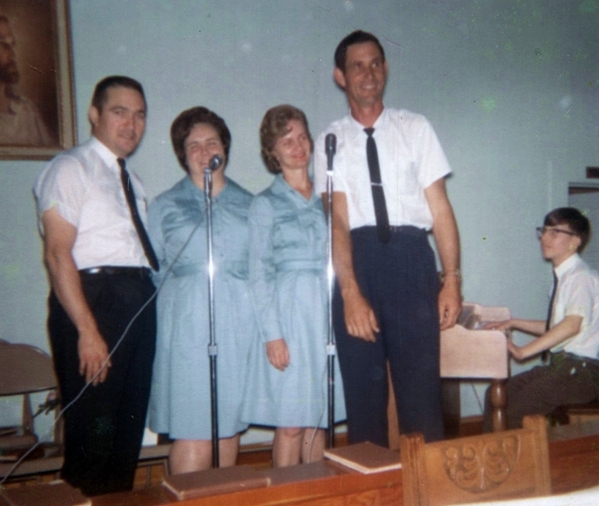 My first "professional" gig was as pianist for The Gloryland Five, a southern gospel quartet. By age 14 I had my own instrumental trio. I also became accompanist for the Miss Tennessee Pageant and other pageants around the mid-south. A musical genius named Joe Kincaid was my musical mentor. Joe pushed me into many other musical opportunities with dozens of performances and industrial shows as well as regular hotel and country club gigs. In my early 20s, I became the pianist for Impact Records gospel artists, Doug Oldham and Jack Price and worked in music evangelism. These opportunities gave me the chance to travel from Halifax N.S. to San Diego, California and many places in between. 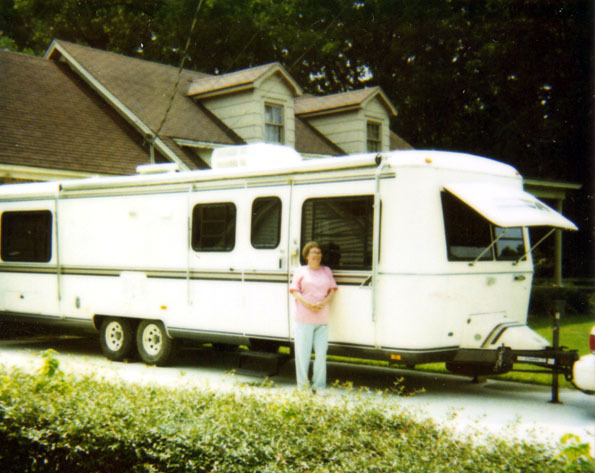 During these years, my traveling/sleeping modes varied from cars and hotels to a customized Silver Eagle Coach, a Twilight Bungalow fifth-wheel, vans and hotels. 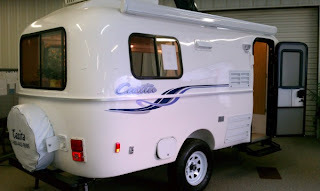 motorhomes and travel trailers. In 1982, I moved to Texas and became the featured pianist at the beautiful Fairmont Hotel in Dallas from 1983 to 1993. At first there was not much traveling except for regular auto trips to my home town in the beautiful state of Tennessee. For a few years I lived in several apartments and even owned a home in the suburbs for three years. But the truth is I am not a house person. To me, taking care of a yard is an unnatural act. Eventually, my perfect little pooch, Shadow, and I moved back into an apartment. Having a yard and doggie door was great for Shadow. But apartment living was more my style than yard work. I clearly do not have a green thumb. During these years every time I would leave the DFW area I longed to be "on the road" again. I love America and enjoy seeing the country on a more relaxed schedule. Although I was based in Dallas, in the late '80s I had opportunities to work with with Kawai America, teaching my three-day organ seminar and giving concerts mostly in Florida and California. 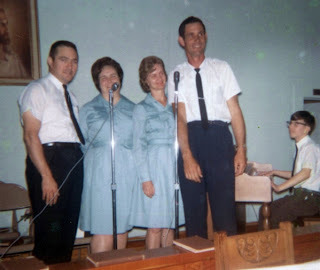 I also had the chance for more travel when I became musical director and conductor for RCA Recording artist John Gary. I performed with and conducted symphonies, orchestras and big-bands all over the country, sharing the stage with Andy Williams, Flip Wilson, Johnny Nash, Pat Boone and many others. That's when the RV bug hit me again. John Gary planned to open a theatre in Branson, Missouri and asked me to be the musical director. What a great chance to perform many months, then take time off to see the country. Of course to me that meant seeing the country in an RV. Unfortunately, John had some health issues and passed away. Death stole a great voice from the American music world. Still I knew I wanted to travel. You can read some more about this at the first Airstream History page on the internet. I had always been an Airstream fan. 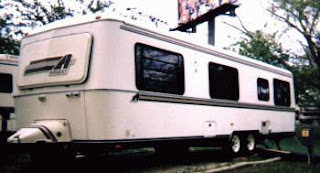 After much research, in 1997 I bought a 1986 32' Argosy, a "squarestream" trailer that Airstream produced for six years. The Argosy is a more "square" Airstream with slightly less rounded corners. 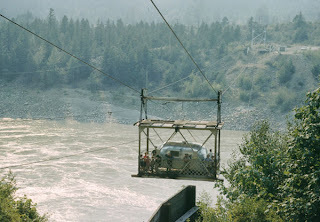 The Argosy also tows great, like the classic Airstream. My plans were to travel with the Argosy while teaching my piano seminar and occasionally performing. But while I was making these plans the economy changed, I had a couple of contracts broken and I never left town. I ended up "fulltiming" in one location, living in my beautiful 1986 32' Argosy for over ten years, all the while planning NOT to live in it full-time. In April 2009 I bought a 36' Nuwa Hitchhiker fifth wheel with three slide-outs. As much as I loved the Argosy, this thing is like a home compared to the Argosy. So now, I have the Argosy and the Hitchhiker. Living Room In the HitchHiker - Party Time! The Airstream mystique is an unusual affair. It draws you in like a magnet and holds you, eventually consuming your thoughts, your emotions, your very life. But how long can you nurse an obsession? I finally decided I might have had my time with that. But it took one final, very different device to push me into seriously considering giving up the idea of Airstream ownership. 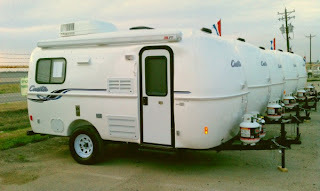 Enter the Casita Freedom Deluxe...a beautiful, lightweight, molded fibreglass travel trailer! As I type this I am still making plans and given my artistic/creative personality, my plans are subject to change. Today the plans will include eventually selling the Argosy, buying the Casita, using the Hitchhiker as a home base and embracing the Casita as the Don Pod for traveling around the country. Eventually the Hitchhiker will be replaced by a more permanent home of some sort, probably in Florida. But again this is all subject to change. Eventually the Casita will assume The Don Pod title from the Argosy. Who knows what lies ahead. But am making plans while life happens around me. Without a vision, one perishes. I have had the vision for several decades and worked it out in various ways over time. Life isn't over yet...so I'm still making plans and living my plans every chance I get. You should be, too. "The following tell[s] the story of one of America's least known but fastest growing persuits -- traveling by trailer. For Traveling by Trailer has become more than an avocation or hobby -- it is very nearly a way of life for several hundred thousand Americans who have the means, the leisure and the desire to discover the world in a a new way -- and in doing so, often to discover themselves." The most recent post is at the top of the page. The first post is at the end. If you want to read from the beginning, go to the last post and come this way.